Pirmasens, 05/05/2014. For PUR and PET processors with high residual material volume, reprocessing can significantly lower production costs. 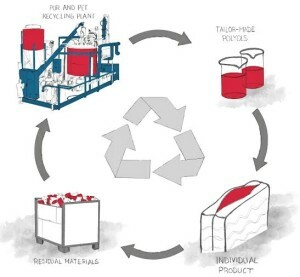 RAMPF Ecosystems and Keil Anlagenbau, Germany, the leading specialists in the conceptual designing and construction of customized PUR and PET reprocessing plants, will illustrate how to cut costs and protect the environment at the UTECH North America 2014 from June 4 – 5. It’s a win-win situation – economically and ecologically: the recycling of residual material from PUR and PET production means less consumption of raw materials and a reduction in energy spending via lower transport and disposal costs. Environmentally sustainable production cycle by RAMPF Ecosystems and Keil Anlagenbau: the residual materials from PUR and PET production are reprocessed and manufactured into high-quality alternative polyols using technologies form the two companies.The recycled polyols are tailored to the production of PUR and PIR based products of the customer. RAMPF Ecosystems and Keil Anlagenbau have vast experience in developing innovative recycling solutions and in industrial plant construction. This knowledge goes into the conceptual designing and construction of customized PUR and PET reprocessing plants for producers with high residual material volume. This enables the manufacturing of highly-engineered alternative polyols on site at the production plant of the customer. The polyols meet the highest quality requirements and are tailored to the production of the PUR and PIR based products of the customer. For more than 20 years, teams at RAMPF Ecosystems have successfully been researching and developing alternative polyols. At the company’s site in Pirmasens, a city in the German state of Rhineland-Palatinate, several large industrial plants use specially-developed chemical processes to convert PUR and PET waste into high-quality alternative polyols which are tailored to the needs of the customer. Utilizing this knowledge, RAMPF Ecosystems also develops and sets up plants directly at the production sites of customers with a particularly large-volume of residue. This enables the local manufacture of low-cost, high-quality polyols. Keil Anlagenbau was founded as a family business in 1973 and is now active around the globe constructing industrial plants. Its 130 highly motivated and highly qualified staff has made Keil Anlagenbau one of the leading providers of tailored and turnkey plants. The owner-run company prides itself on the high-quality, smooth planning, production, and maintenance of tank farms, production facilities, and supply plants for solid, liquid, and gaseous materials. Since 2004, Keil Anlagenbau has specialized in the design and construction of industrial-scale PUR and PET reprocessing plants, a technology which was developed as a patentable process. Customers can be sure of first-class quality control in development and production.